This past fall, Cathedral Prep and Seminary, Elmhurst, established the Cathedral Basketball League. 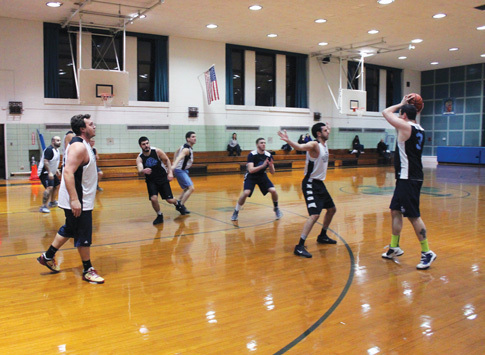 Over 35 former students play a 12-week schedule of games in the school’s gymnasium, which allows them to reconnect with their old stomping grounds. There may only be one thing better than rekindling old high school friendships, and that’s rekindling old high school friendships while playing some competitive basketball, and this new hoops league allows for both. “We at Cathedral are very proud of our alums, and we know that their time at Cathedral was so much an important part of who they are that we wanted to open the doors to create an opportunity for them to rekindle relationships and find the brotherhood in more strength, so we decided to have an alumni basketball league,” said Father Joseph Fonti, rector-president. Cathedral Prep is known for its strong network of alumni, but it has been challenging at times to get some of the more recent graduates back to the school. But once competitive basketball became an option, the interest soared. The games have been extremely competitive so far, but this new league is all about providing the opportunity for the Crusaders to see some old friends and reminisce about high school memories. The league itself is comprised of four teams, each representing one of the Cathedral Prep fraternities, including the Knights of Cathedral Prep, the Warriors of St. Michael, the Defenders of the Faith and the Protectors of the Holy Name. These were started under Father Fred Marano, the school’s previous rector, to allow for a more intimate exchange among the grade levels. “The names themselves are very strong names that capture a masculine spirituality and a call to service,” Father Fonti said. After several weeks of pre-season games, the league is now up and running. It has taken off so quickly that there are already plans in place for a full slate of playoffs and a championship game. We know winning is fun, but the league is more about re-establishing friendships, networking with fellow graduates and most importantly getting in some quality exercise each week. McQuail, a former power forward for the Crusaders, was quick to add that he has not lost a step on the basketball court. The league is still accepting any new alumni members. Anyone interested should contact the Development and Alumni Office by phone at 718-592-6800 ext. 137 or by email at alumni@cathedralprep.org. Through this new alumni basketball league, Cathedral graduates are able to return to the place that started them on the journey to become men for greatness. And of course, they get to play some competitive hoops in the process.